Hope you didn't glue the pan on to the clam by mistake! Can I purchase just the two wing pieces and not the center section? If so what is the price. New sets available for Elise, Exige and Evora. Wife PM'ed you tonight about a set for her Elise. Please advise. I bought these a few months ago for my Elise. Super easy to install. Ended up using 3M VHB double sided tape and they've been nice and secure ever since. I will say that I mounted the center piece more flush than others have done. I just didn't like the way it looked protruding out, I bought it to give me some peace of mind on sharp inclines, driveways, etc... Not to prevent damage from hitting something while driving. It still sticks out a bit, but is hardly noticeable. I would highly recommend them to everyone not using any other type of protection for the front, cheapest insurance you'll ever get! 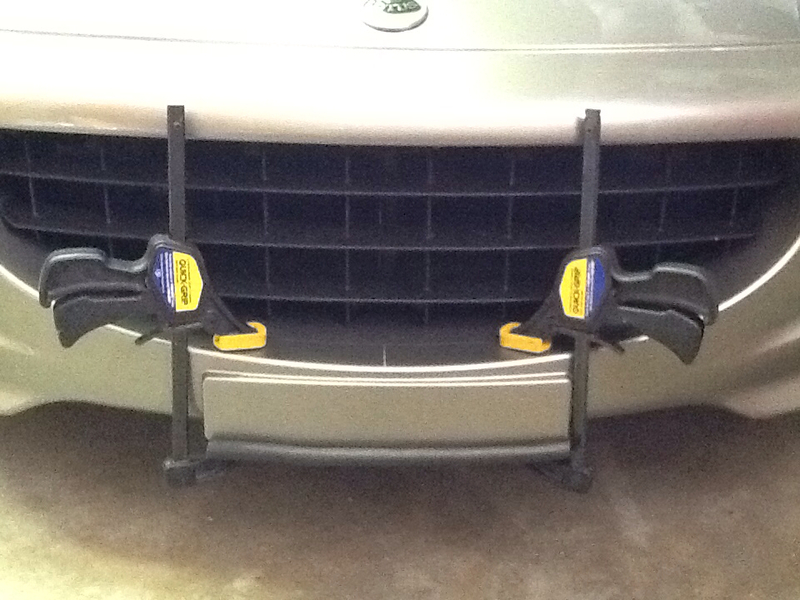 Has anyone used these in conjunction with the aftermarket splitter from Lowtush? Does anybody have any feedback for helping against hitting cones at an auto x? Will it help with that kind of impact, or is it just to help with scrapes from underneatch? I bought a car with these and the passenger side one vanished! Will you sell me just that one piece? Looking for a set, please PM or Paypal me at [email protected]. PayPal sent to your email address. To SirLotus. Elise #2393 Bordeaux/Biscuit Interior/Touring and Sport Packs/HT/Sport ECU/GPan3/DSBrace/Quantum Black SA Dampers/Lowered, Corner Weighted/Radium Catch Can/HKS Special Edition Exhaust/New "3M" Starshield/WindowTinting. Purchased new 06/01/05. First in Class 2008 Speed Ventures Lotus Challenge Series, my son as Driver. PayPal sent to your email, Michael. Thanks. Would you make these for splitters? Sure if you supply a patten for me. My solution for securing the middle one while the silicone dries. Not as creative as the "frying pan technique" of High_Colorado. More sets available for Elise, Exige and Evora.